I’ve been cooking up a lot of recipes using tomatoes lately, including these really tasty cheesy orzo-stuffed baked tomatoes. Here’s the story: This was the very first summer that I grew my own garden at home. I was actually really nervous at first because I wasn’t sure how much time and labor (and expense!) would go into the whole thing. Now I know I never had anything to fear. Gardens can and will grow with very little time, effort, or know-how. It was actually really thrilling to see these baby tomatoes emerge for the first time. Although we weren’t successful with every single thing we planted this time around (we didn’t provide nearly enough space for the poor corn stalks to grow), our garden is now producing many, many more beautifully ripe tomatoes than Meat-and-Potatoes-Guy and I can even begin to eat. Bonus surprise: being able to eat them immediately after they’ve been picked (when they’re perfectly ripe) has provided the most sweet and delicious tomatoes Meat-and-Potatoes-Guy and I have ever tasted! My only regret now is not growing a garden sooner. I wanted to make the most of these fresh tomatoes by adding the flavors that Italian cuisine has taught are the very best complements: mozzarella, parmesan, olive oil, garlic, and pasta! I stuff the fresh tomatoes with all of the above and toss them into the oven to create a warm, gooey baked dish of deliciousness. It’s a complete, all-in-one healthy vegetarian dinner. But it tastes like comfort food! Cut the tomatoes in half horizontally and use a spoon to hollow out the insides of the tomatoes, discarding the pulp and seeds from the center of the tomatoes. Arrange the tomatoes in a large casserole dish so that the hollow sides face upright. Measure about 1 tablespoon of olive oil and, using a basting brush, brush oil over each tomato half. Season well with salt and pepper. Set aside. Add breadcrumbs, 1 tablespoon parmesan, and 1 tablespoon olive oil to a bowl and stir until all breadcrumbs are well coated in oil. Set aside. Boil a large saucepan of water. Salt the water and add the orzo. Cook until almost al dente, about 7 minutes, drain, and add back to the saucepan. Meanwhile, as water is boiling, heat 1 tablespoon olive oil in a sauté pan over medium heat. Add the garlic and onion and cook until softened, about 2-3 minutes. Remove from the heat. Add sautéed garlic and onion to the saucepan containing the cooked and drained orzo. Also add ½ cup parmesan and all of the cubed mozzarella. Season well with salt and pepper. Stir until everything is well combined and the cheese is melted. Spoon the orzo mixture into each tomato half, filling each to the brim. Top each stuffed tomato with a spoonful of the breadcrumb mixture. Bake for about 7-10 minutes, or until the breadcrumbs are crisp and golden. Serve. And here are the step-by-step instructions. Begin with all of these ingredients. Cut the tomatoes in half horizontally and use a spoon to hollow out the insides of the tomatoes – all of the seeds and the pulp – to discard. 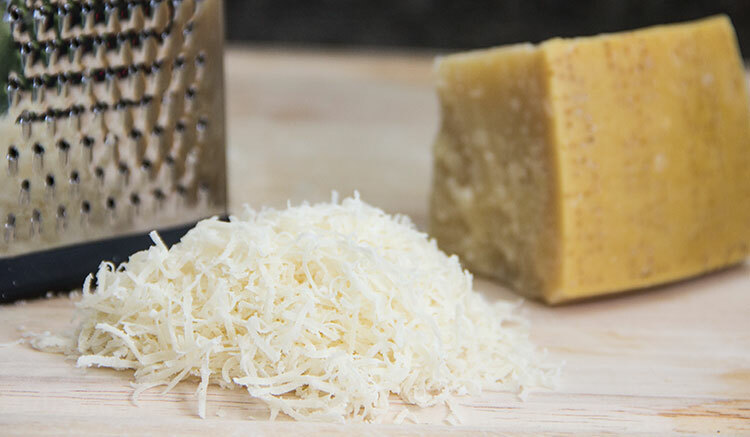 Then grab a block of fresh parmesan cheese and grate it. Using a real block of parmesan makes all of the difference in the flavor! And take some fresh mozzarella and dice it up into small cubes. Fresh mozzarella like this works best for this recipe! Grab a bowl and add some whole wheat panko breadcrumbs, a pinch of the grated parmesan, and a bit of olive oil. Stir until all of the breadcrumbs are well coated in oil, and set it aside for now. Next, preheat the oven to 400 degrees F.
And boil a large saucepan of water. Salt the water and add some whole wheat orzo (the pasta that’s perfectly sized for stuffing tomatoes!). Cook until it’s almost al dente (it should still have a bit of a bite), drain it, and then add it back to the saucepan. Meanwhile, as the water is boiling away, smash a couple of cloves of garlic, peel off the skin, and run your knife through the garlic in every direction, mincing it up. Also chop both ends off of a medium onion and cut it in half from top to bottom. Peel off the skin, place one half flat-side-down on the cutting board for stability, and dice it up. Then heat a bit of olive oil in a sauté pan over medium heat. Add the garlic and onion and cook until they’re softened, then remove from the heat. Spoon the sautéed garlic and onion into the saucepan containing the cooked and drained orzo. Toss in the grated parmesan and cubed mozzarella. Stir until everything is well combined and the cheese is melted. Next, arrange the tomatoes in a large casserole dish so that the hollow sides face upright. Measure out about one tablespoon of olive oil and, using a basting brush, brush a bit of oil over each tomato half. And season the tomatoes well with salt and pepper. Then spoon the orzo mixture into each tomato half, filling each one to the brim. Top each stuffed tomato with a spoonful of the breadcrumb mixture. And bake the tomatoes until the breadcrumbs are crisp and golden. Then serve while the stuffed tomatoes are still warm from the oven! This is such an indulgent-tasting, rich, cheesy dish. The flavors of garlic and olive oil and fresh mozzarella make the very most of fresh, in-season, nutrient-rich tomatoes. And the breadcrumbs add a tasty, crunchy contrast. This one is so delicious. I must applaud you for all the hard work you put into your site–from the excellent step-by-step photos, to the nutritional information, to the delicious, practical, and unique recipes. Will definitely try this. Bravo! This looks great! I love that it’s in a tomato! I never would have thought to stuff tomatoes before.. this is such a good idea. Definitely craving some of the cheesy goodness right now. Looks delicious! Just finished up a dinner with this recipe, it was delicious! We made 2 modifications that I thought worked well. 1) we did half orzo and half quinoa to add a bit more protein and cut back on our pasta intake. 2) added a bit of marjoram…The filling needed just a bit of punch because mozzarella doesn’t have a ton of flavor. Thank you for keeping up with this fantastic blog! I cook your recipes all the time and always get so many compliments.